"Who are they [the feds] preparing to battle?" Today, in The Wall Street Journal, our Honorary Chairman Dr. Tom Coburn and Founder/CEO Adam Andrzejewski break our oversight report on the militarization of our non-military federal agencies. We quantified $1.48 billion in non-military federal agencies purchase of guns, ammunition and military-style equipment during the last nine years. We found that there are more non-military federal officers with arrest and firearm authorization (200,000+) than U.S. Marines (182,000). Who Has More Firepower? Share our info-graphic at RealClearPolicy, click here. Sixty-seven non-military federal agencies spent $1.48 billion on guns, ammunition, and military-style equipment. Of that total amount, 'Traditional Law Enforcement' Agencies spent 77 percent ($1.14 billion) while 'Administrative' or 'General' Agencies spent 23 percent ($335.1 million). Non-military federal spending on guns and ammunition jumped 104 percent from $55 million (FY2006) to $112 million (FY2011) from high to low. Since 2004, Department of Homeland Security (DHS) purchased 1.7 billion bullets including 453 million hollow-point bullets. As of 1/1/2014, DHS estimated its bullet inventory-reserve at 22-months, or 160 million rounds. The Internal Revenue Service, with its 2,316 special agents, spent nearly $11 million on guns, ammunition and military-style equipment. The Department of Veterans Affairs (VA) spent $11.66 million including more than $200,000 on 'night vision equipment,' $2.3 million on body armor, more than $2 million on guns and $3.6 million on ammunition. Please read our Wall Street Journal column, Why Does the IRS Need Guns?, read here. 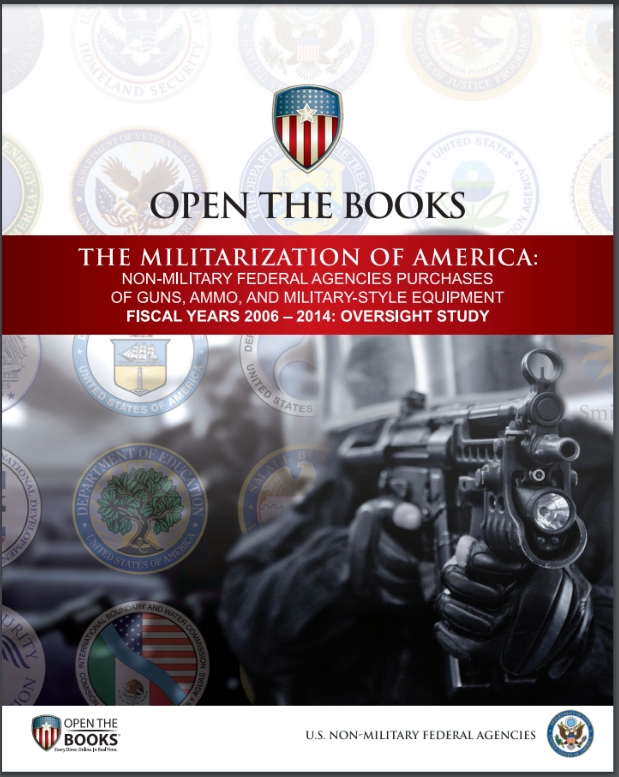 Download our OpenTheBooks Oversight Report - The Militarization of America, study here. Share in the conversation on our Facebook page: share here.